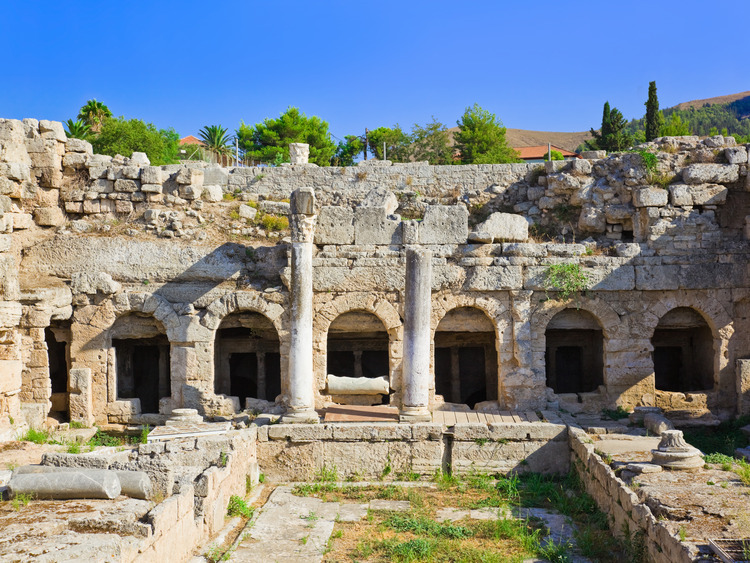 A thrilling excursion to discover ancient Corinth and the important archaeological remains that testify to its ancient splendour, and the famous canal, a great feat of engineering, which links the Ionian and Aegean Seas. We travel back in time to Ancient Corinth, whose remains are partly those of an ancient Greek city built in the 6th century BC and partly those of a Roman city built in the year 44 BC. The latter was built when Julius Caesar established a colony for army veterans in this desolate area where the Greek city of Corinth had stood until 146 BC, when it was destroyed by Mummius and his ten legates. We admire the remains and excavations of both cities, which were true artistic and architectural masterpieces: a Christian basilica, the starting line of a Greek hippodrome, a sacred spring with 5th-century BC bronze spouts in the shape of lions' heads, and the elaborate Roman-age Pirene Fountain. The visit to the Corinth Canal is unmissable. It is 6 kilometres long, 23 metres wide and 8 metres deep, with sloping sides that reach 80 metres in height. The idea of building a canal to cut across the isthmus linking the Ionian and Aegean seas dates back to Roman times, but work was not begun until 1881.